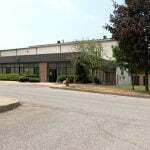 MacKenzie Commercial Real Estate Services, LLC is pleased to announce the recent sale of 4611 North Point Boulevard, a 57,401 square foot industrial warehouse building situated on 17 acres in Baltimore, Baltimore County, Maryland. Zoned for heavy industrial, the building’s attractive location to I-95 and I-695 and the availability of space for additional development attracted the buyer, leading to a higher than asking sales price. Michael Spedden, Vice President and Don Schline, Senior Vice President/Principal with Mackenzie represented the seller in the transaction. For more information on MacKenzie’s industrial sales services, please contact Michael Spedden at 410.494.6644 or mspedden@mackenziecommercial.com, or Don Schline at 410.494.6648 or dschline@mackenziecommercial.com.For more information on MacKenzie, please visit www.mackenziecommercial.com.